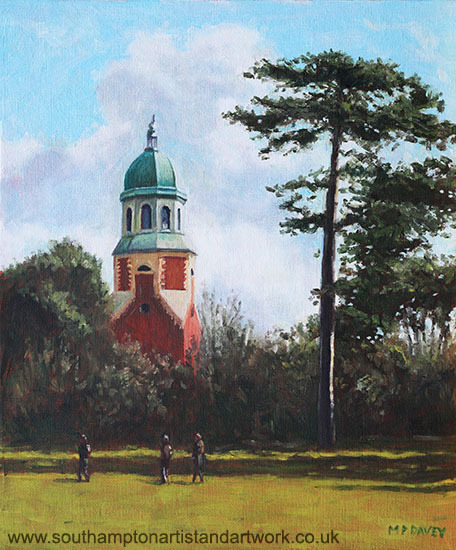 An oil painting of the Victorian tower of Netley Hospital Chapel, rising above the trees in the Royal Victoria Country Park, Hampshire. The chapel is now the only part of the large Military hospital that was situated there still in existence. The park is very close to the Southampton Water/ Weston Shore area of Hampshire and the Chapel tower a local landmark. The painting measures 10” x 12” and was based on a poor quality mobile photograph taken during a sunny winters day. It was painted using the 'wet in wet ' technique during a one day sitting.